Ovid: The Classical Heritage, first published in 1995, contains a diverse collection of reflections, ranging from the first century, through the Middle Ages, to the twentieth, on a poet who has been adored and reviled in equal measure. With the entire notion of ‘Western culture’ under duress, the need to establish continuity from antiquity to modernity is as pressing as ever. Each essay, selected by Professor Anderson, indicates an Ovidian theme or perspective which remains relevant to our self-understanding today. An enormous range of topics is investigated, in a variety of modes and styles: contemporary reaction, reception by Medieval Schoolmen, Ovid’s influence on Chaucer, and his importance for the ‘New Mythologists’. 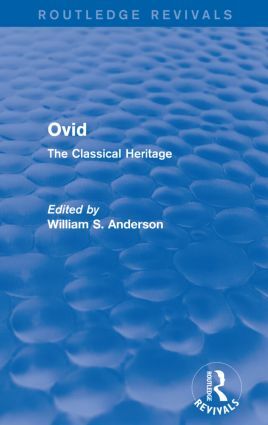 Overall, Ovid: The Classical Heritage offers a rich selection of essays, which cumulatively demonstrate the continuing importance and fascination of this great Roman poet.